Field rollers for pastures and paddock management and maintenance. The field rollers are suitable for a variety of terrains, from small or large fields, horse paddocks, parkland and sports fields to horse arenas and agricultural ground. Using a field roller helps to firm up the pasture and grass, discouraging weeds from germinating. It firms pastures preventing damage to other equipment. The roller will flatten mole hills, keeping sports fields in top condition. Using a paddock roller will flatten the ground, compressing stones and preventing pot holes. 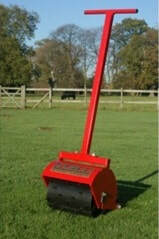 The paddock roller is useful for smallholders, farmers, land and estate owners and equestrian users. The field rollers can be used all year around whether for firming the soil after topping or harrowing, levelling the terrain after seed planting or beautifying sports grounds. 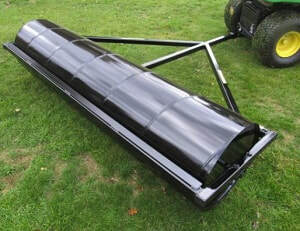 Field rollers can be towed with and ATV farm quad or 4x4 if used with a ball hitch. A pin hitch will allow the paddock roller to be used with a tractor. Some of our paddock rollers can also be filled with water for extra weight. 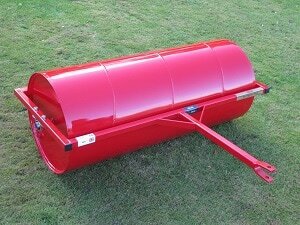 ​The LR-150 field roller is ideal for the maintenance of lawns, fields and paddocks. These field rollers can be towed behind a compact tractor, UTV or ATV vehicle. 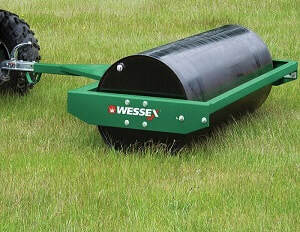 Whether you use it with water to increase the weight or empty, this Wessex paddock roller will give a perfect finish to grass and turf. Available with a choice of clevis or ball hitch. The LR-150 field roller is equipped with an adjustable scraper bar. 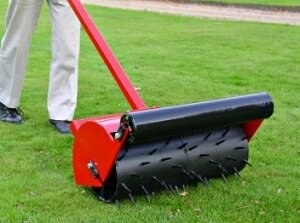 ​This small metal garden roller is very useful in areas where a larger roller can not be worked. It can be used behind low horse power tractors (10hp) or by hand with the optional hand conversion kit. To gain weight, the roller may be filled with water. This greatly increases its weight and therefore its rolling performance. Weight unballasted: 35 kg (70 lbs) approx. Water ballasted: 222 kg (490 lbs) approx. ​​​Call us on 0845 3731 832 for more information or a quotation. 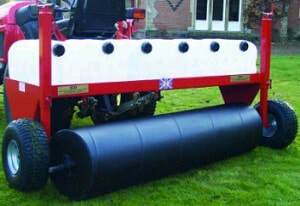 ​​The FG6HGR field roller has a diameter of 18" (450 mm) with a working width of 72" (1800 mm). This field roller is mounted on ball bearings. A mud scraper bar is fitted to prevent build up of soil. 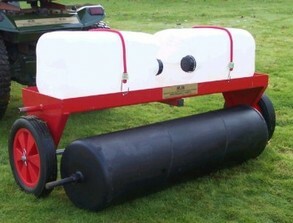 ​This field roller can have water or sand added to provide extra weight. The Sorrel roller attachment is ideal to break up crust that forms on compacted soil. The spikes penetrate the surface of the field allowing the air, nutrients and especially water, to start their journey into the roots. 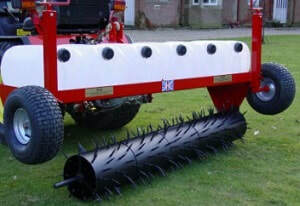 This field roller has 200 tines.The unit weighs 32 kg. This field roller unit must be used in conjunction with either the t​owed or mounted frame (FGF48T or FGF48M) models. The carrier frame fitted with the firming field roller is a new addition to the SCH heavy duty field and paddock roller's system. Its purpose is to firm up grassed areas in the spring, before the heavy growth period commences. The carrier frame fitted with the field roller attachment is an ideal tool to firm up grassed areas in the spring, before the heavy growth period. ​This field or paddock roller unit must be used in conjunction with either the towed or mounted frame. 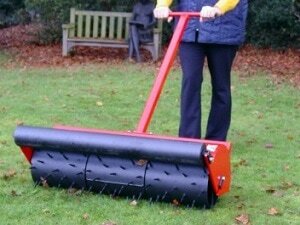 The hand operated sorrel grass roller is ideal for use on fine turf surfaces, cricket squares, tennis courts and bowling greens. 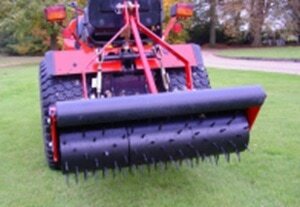 Limited penetration multi toothed drums will penetrate the surface to alleviate the surface compaction allowing air and nutrients to get to the root system. When flood watering is carried out the multi holes disperse the water to the roots extremely quickly. 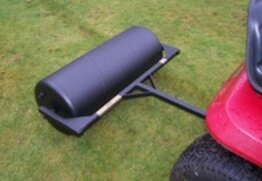 A small roller is incorporated to iron out any small bumps.The grass roller also makes it easy for transporting from the shed to the pitch. Spikes can be replaced when worn. 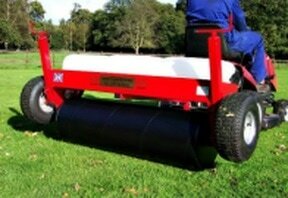 This roller is very effective for use on fine turf surfaces, cricket squares, tennis courts, bowling greens etc. Limited penetration multi toothed drums will penetrate the surface to alleviate the surface compaction. This allows air and nutrients to start their journey to the root system. When flood watering is carried out the multi holes disperse the water to the roots extremely quickly. A small roller is incorporated to iron out any small bumps. The roller also makes it easy to transport the unit from the shed to the pitch. Spikes can be replaced when worn. Ideal for use on fine turf surfaces, cricket squares, tennis courts. bowling greens etc. Limited penetration multi toothed drums will get through the surface to alleviate the surface compaction, allowing air and nutrients to start their journey to the root system. When flood watering is carried out the multi holes disperse the water to the roots extremely quickly. A small roller is incorporated to iron out any small bumps. The roller also makes it easy to transport the unit from the shed to the pitch. Spikes can be replaced when worn. ​The Sorrel roller attachment is ideal to break up tough crust that forms on compacted soil. 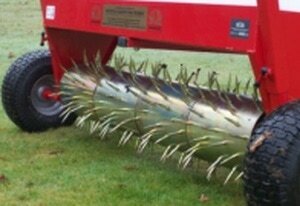 The spikes of this roller penetrate the surface which allows the air, nutrients and especially water to start their journey into the roots. This roller unit must be used in conjunction with the 60" carrier frame. This roller attachment fixes to the underside of the carrier frame. Ballast can be added up to the limit of your three point linkage capacity. This field roller unit must be used in conjunction with the 60" carrier frame.